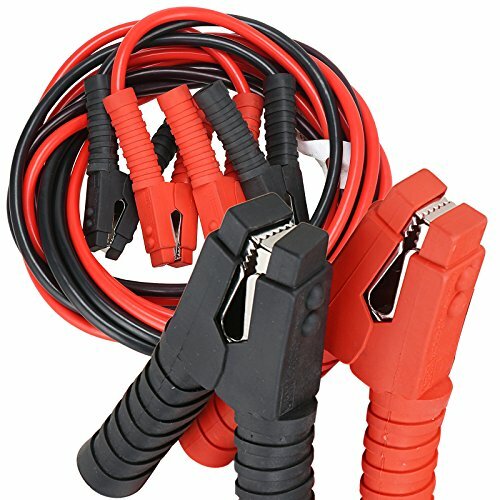 This professional 20 Foot 1200AMP Thick Jump Cables with case is an essential safety and security tool for every vehicle. Dealing with dead battery, we have to have our vehicles started now and then, it's best to have a set of cables on hand. QUALITY CONSTRUCTION - PVC insulation jump leads with resistance to heat, oil and acid. All-insulated handles over the clamps ensure safe in use. EASY TO REACH - Tangle-free 20 Feet long ensures to jump the battery of any other car with ease, no matter parked at the rear or front. Zipped carry case with handle for easy storage. LOW TEMPERATURE RESISTANCE - This jump start cables work fine even under low temperature conditions, ready for Winter season. APPLICATIONS - Ideal for 6V, 12V and 24V vehicles including cars, vans, trucks, SUVs, even Large Agricultural & Commercial Vehicles. Also suits for 12V batteries and all petrol and diesel engines up to 9500cc. View More In Battery Jumper Cables.